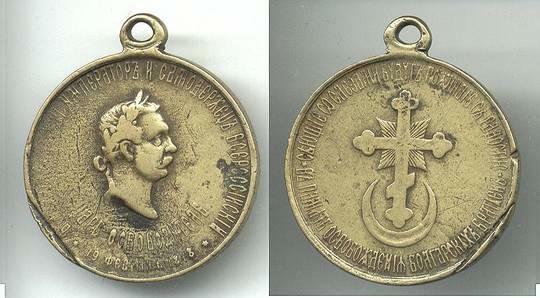 You are looking at a medal for the Liberation of Bulgaria instituted on April 17, 1878. This bronze medal was awarded to enlisted men and non-commissioned officers of the Imperial Army who participated in the liberation of Bulgaria from the Turks. The obverse has the bust of Emperor Alexander II facing right surrounded by the Inscription, EMPEROR ALEXANDER II AUTOCRAT OF ALL THE RUSSIAS. Below the bust is the Inscription, EMPEROR'S LIBERATION, and below this the date, February 19, 1878. The reverse has a russian cross above a Turkish Crescent. At the top is the inscription, THOSE WHO SOW WITH TEARS WILL WEEP WITH JOY and at the bottom, IN MEMORY OF THE LIBERATION OF OUR BULGARIAN BROTHERS.